Fly Fish from your Backyard, Walk to Downtown Ketchum! Located on a Private River-Fed Pond with Unobstructed Views of Bald Mountain this Impeccable 4 BR / 3.5 Bath Ketchum Home with Central A/C and a Private Hot Tub is the ideal spot for your next Sun Valley Ski or Summer Vacation. Professionally decorated, guests will appreciate the Sumptuous Furnishings and High End Electronics throughout this Luxury Ketchum home. Year round, guests will enjoy gazing at Baldy from the Private Hot Tub on those chilly evenings. In the Summer and Fall seasons, fly fisherman will most certainly take advantage of the excellent fishing on the Private Pond (no license required) and easy access to Warm Springs Creek and the Big Wood River. BR 2- KING GUEST SUITE: Features King Bed Flat Screen TV, and En Suite Bath with Glass Shower- is easily accessible and a great choice for mobility challenged guests. DINING AREA: The dining seats 8, with French Doors leading to the furnished Stone Enclosed GARDEN TERRACE, with Water Feature and Gas Grill. GOURMET KITCHEN: adjacent Butler's Pantry with Microwave and Wine Storage in the Secondary Fridge leads to the gourmet kitchen, a chef's delight, fully equipped and features a Wolf 6-Burner Gas Cooktop, (2) Gas Ovens, SubZero Fridge and beautiful views of the pond and mountain. LIVING AREA: The living area, adjacent to the kitchen, features a Wood Burning Fireplace, Flat Screen TV, SONOS, Game Table and fantastic views. OTHER FEATURES: There is a POWDER ROOM and a LAUNDRY ROOM with a Full Size W/D on the Main floor for your convenience. OUTDOOR LIVING: Head out the French Doors and dine al fresco or relax on the furnished WATERFRONT PATIO or soak the day away in the PRIVATE HOT TUB under the stars. BR 2- KING MASTER SUITE: This spacious Master Suite features His and Her Closets, King Bed, Flat Screen TV, Bald Mountain and River Views, and a Luxury En Suite Bath with Dual Vanities, Glass Shower, and Separate Tub. French Doors lead to the huge BALCONY with Chaise Lounges, Lounge Chairs, Coffee Table, and Automatic Canopy- a fantastic spot to enjoy a book, the views, or take a siesta. BR 3- GUEST SUITE : With (2) Twin Beds with Flat Screen TV and an En Suite Bath with Glass Shower. There are (2) doors to this suite - a suite door and a bedroom door- allowing privacy to the bedroom while providing access to the bathroom for guests in Bedroom 4, if necessary. FAMILY ROOM: Located at the end of the hall with access to the Balcony, this comfy family room features a Flat Screen TV, SONOS, Mountain and River views, and a Wrap Around Sofa. Additionally, there is a secondary LAUNDRY ROOM on the 2nd level for your convenience, Free WiFi, heated 2-Car garage, Snowmelt System, and DirectTV with Premium Movie Channels, for your enjoyment. Enjoy your Sun Valley Vacation! 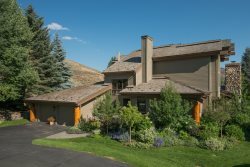 Highly sought after, Ketchum vacation homes and condos are steps from Ketchum restaurants, shops, parks, and galleries and within a mile to the River Run Ski Lifts, Big Wood River and the Sun Valley Lodge, Pavilion, Ice Rinks, and Stables. Most guests leave the car behind and walk, bike, or take the free shuttle to their destination.